Our Founder and author of this article, Ryan Raker, has been designing, tuning, and manufacturing shocks with digressive, linear and progressive damping curves since 2001. During that time he used state of the art shock dyno’s to design and/or tune premium shocks purchased by nearly every lift kit manufacturer. As a result AccuTune Off-Road is uniquely familiar with the real world pros and cons of each type of shock, how to tune them, and their proper applications. Shocks can be digressive on compression , rebound or both, and each has it’s own pro’s and cons. The terms Digressive, Linear, and Progressive refer to the shape of damping curve produced by a shock (as seen below). 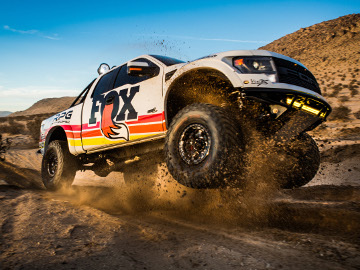 Most Fox shocks and most King shocks are linear, while most Icon shocks and entry level Bilstein shocks (5100 & 6100) are digressive. The graph below is data directly off a shock dyno and is used for illustration purposes only. If these were rebound loads, and the shocks were tuned for the same vehicle they would likely intersect around 10 in/sec or less. If they were compression loads they would likely intersect around 100 in/sec. Shock design and tuning can impact performance on small bumps/washboard, large bumps/whoops, g-outs, and handling. Creating the perfect damping curve is all about making the right trade offs to achieve the correct performance across all suspension events. In the examples below it is assumed each of the shocks are well designed and very digressive or very progressive in order to explain the differences. Small bumps and small washboard cause the wheel to make very fast, but very small movements. Because the movements are so small the valve disks may not have a chance to open. As a result these forces often happen around 2 to 10 in/sec on both compression and rebound. From the graph we can see that digressive pistons would be stiff and possibly harsh while progressive shocks would be very smooth. Because the movements are small tire pressure and tire stiffness can play a large roll in ride comfort. Large Bumps and Whoops are high speed events on both compression and rebound and it’s important to think about what happens to both the chassis and the wheels. On compression the wheel may move at 200+ in/sec and ideally the shock will do a combination of absorbing the bump and raising the chassis to prevent bottoming out. A digressive shock may blow off so much load that it can’t sufficiently raise the chassis. An extremely progressive shock on the other hand will feel smooth and controlled. On rebound the wheel might move around 50 in/sec. A digressive shock will start by pulling the chassis into the series of bumps before hitting the speed to freely let the wheel move. For shocks with a very digressive damping curve the change in stiffness can cause the vehicle to feel as if it is loosing control. A shock with a progressive rebound damping curve will always feel like the wheels and chassis are disconnected, making for a potentially bouncy ride. On G-Outs and other slow speed bottoming events digressive shock valving will feel firm and controlled. 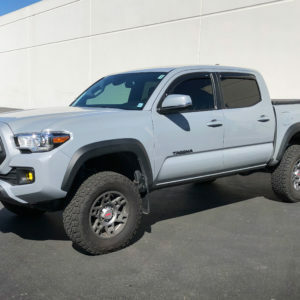 Progressive shock valving will feel out of control because the suspension will bottom very easily and then spring back up very easily. Handling is a tricky one, digressive valving will provide better handling than progressive valving due to the higher force at 2 in/sec. 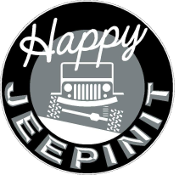 Although shocks and springs will impact handling, but that should not be their primary responsibility. 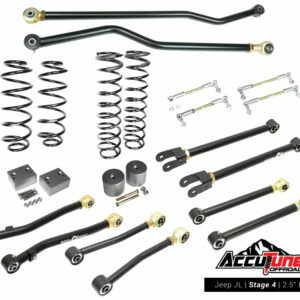 Shocks and springs are the only tuneable elements that control performance over the various suspension events and should be tuned to provide the best ride possible. Handling should be tuned by the sway bar since that is it’s primary responsibility. Digressive shocks are bad at small bumps and large bumps, but good at handling and g-outs. Progressive shocks are good at small bumps and big hits, but bad at handling and g-outs. Linear shocks provide the best all around performance. 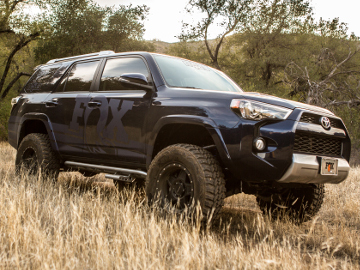 At AccuTune Off-Road we design the shape of the shock curve to provide the performance you want on the type of terrain you will encounter. The result is curves that are slightly digressive, linear, or slightly progressive to deliver the some of the benefits without all the drawbacks. 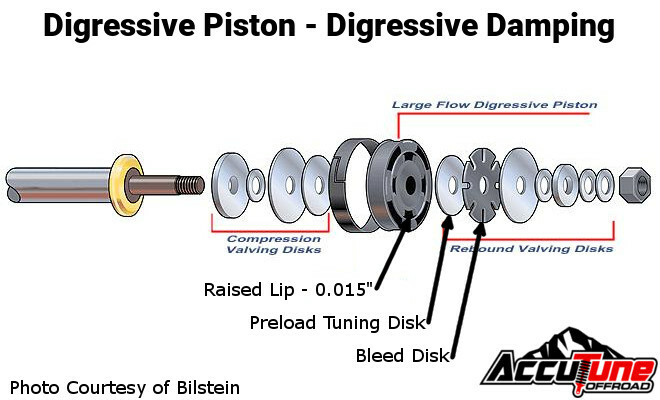 There are two traditional piston designs: Digressive and Linear. 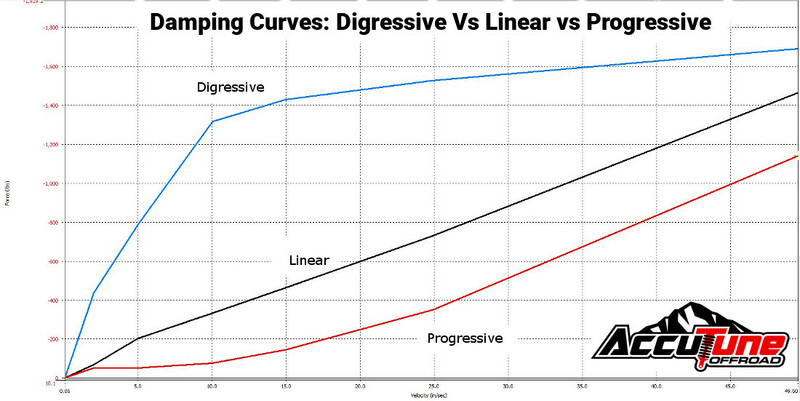 Digressive pistons primarily produce digressive shock curves (duh), while linear pistons can produce digressive, linear and progressive shock curves depending on their tuning. Digressive shocks are made by preloading the valve disks, typically between 0.002″ and 0.015″. The most common way to do this is to design the piston to have a raised outer edge where the piston seals. While some shocks have a clearly raised edge, others are machined in a convex shape that’s less obvious. The drawback to these designs is that slight variations in preload thickness produce drastically different damping loads. Linear pistons feature perfectly flat faces so other techniques need to be used to create a digressive damping curve. If the shock curve does not need to be extremely digressive a linear piston can be made digressive by using a very small through bleed hole. This solution often only works for shocks with a lot of rebound damping. Linear pistons can be used to create digressive damping curves by preloading the valve disks. This can be done with coil springs (sometimes used for through shaft compression adjusters), or by inserting a preload ring into the disk stack. Either way the results are the same. 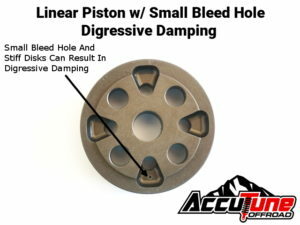 Shock pistons with a flat sealing surface for the disks and sufficient bleed hole size will produce a linear shock curve. Note that even linear shocks tend to have some “nose” or point on the curve around 2 in/sec. This is due to friction and other forces related to the transition of the internal parts from stationary to moving (or reversal of direction). For linear performance it is most common to use pyramid stacks (a stack of valve disks with decreasing diameter as shown below), although it is possible to have linear performance with a flutter stack. There are A LOT of ways to tune linear pistons to have progressive damping curves. All of these designs allow a lot of oil to flow unrestricted at slow speeds, but some techniques are better than others. The methods listed below are ordered from best to worst design. Internal and External Bypass Shocks have additional flow paths through which large amounts of oil can flow relatively unrestricted. Because the free flow is limited to certain parts of the travel they mitigate issues with performance on g-outs by firming up towards the end of travel. 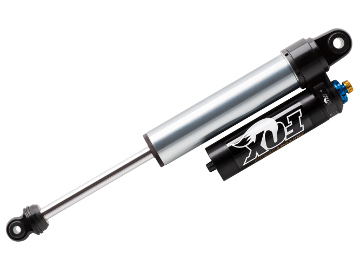 The best designed bypass shocks have multiple stages so the transition from soft to firm can happen closer to ride height and over a longer distance so the shock doesn’t suddenly get stiff. Bilstein produces a 46mm shock that allows additional free bleed in the compression direction by using a check valve. 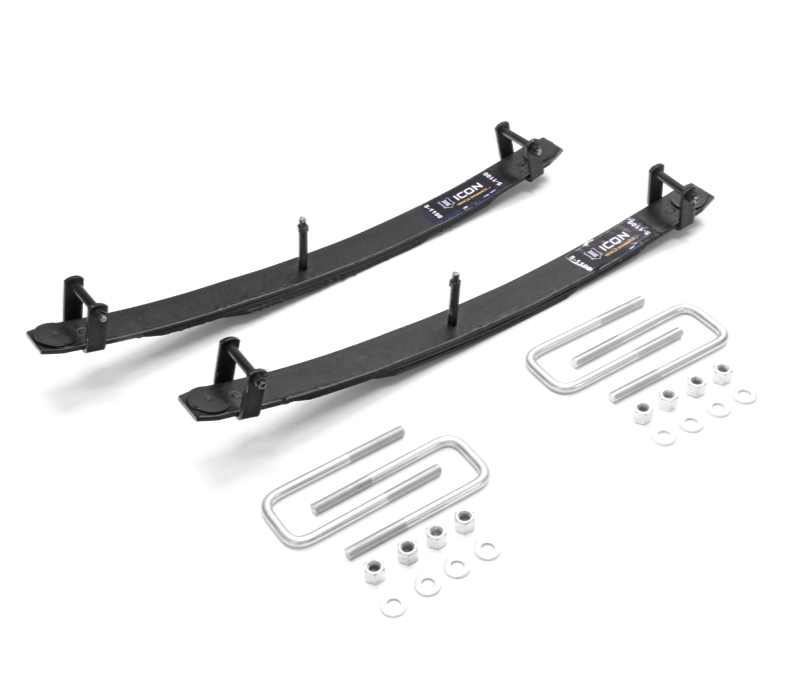 This design can produce progressive damping curves on the compression side where they are most commonly desired. 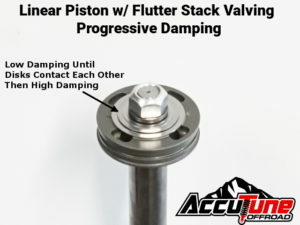 Flutter stack valving is much like directional bleed and is the most universal method for making linear pistons produce progressive damping curves. Because of how they work, flutter stacks can be added to any existing linear piston to produce the exact desired shock curve. 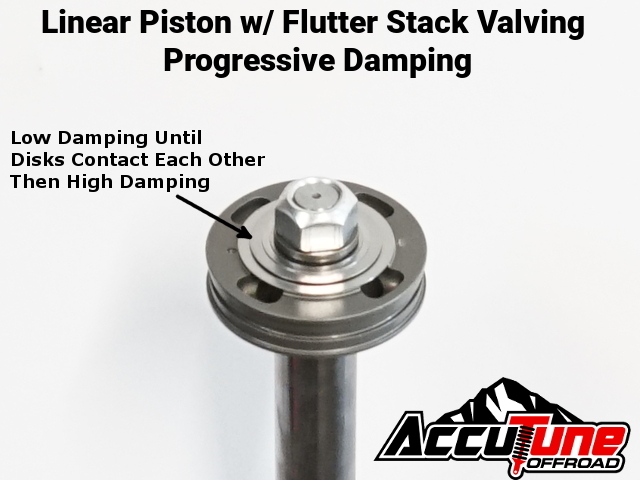 By investing years into field testing and dyno testing we have perfected flutter stack valving. A rate plate works by having soft initial valving which eventually hits a stiff plate that prevents the disks from continuing to deflect. The result is that the main valving starts to work like an orifice and build exponentially more force. These can work well with a lot of tuning and a lot of testing to make sure they never get harsh. 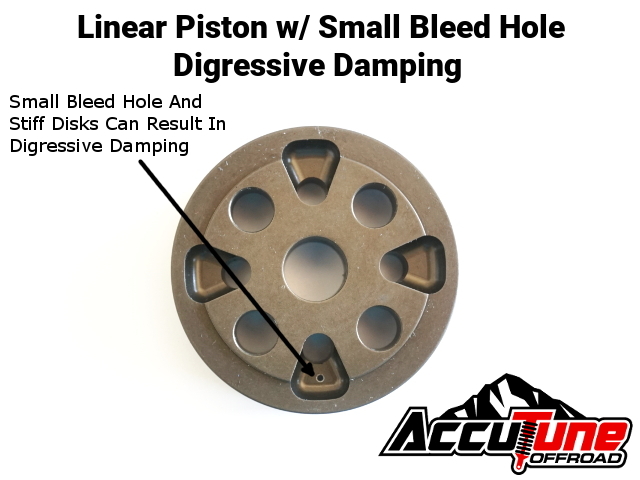 By drilling a lot of free bleed holes in the main shock piston the damping curve can become progressive. As slow speeds oil flows unrestricted through the large holes. 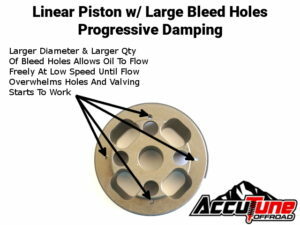 At high speed the holes hit their maximum flow rates and the main piston valving has to start working, making the shock stiffer on the high end. This design makes both compression and rebound progressive which is not always desirable. The final method to making a linear piston progressive is to insert a thin, small diameter disk against the piston which allows oil to free flow before making the main disks deflect. 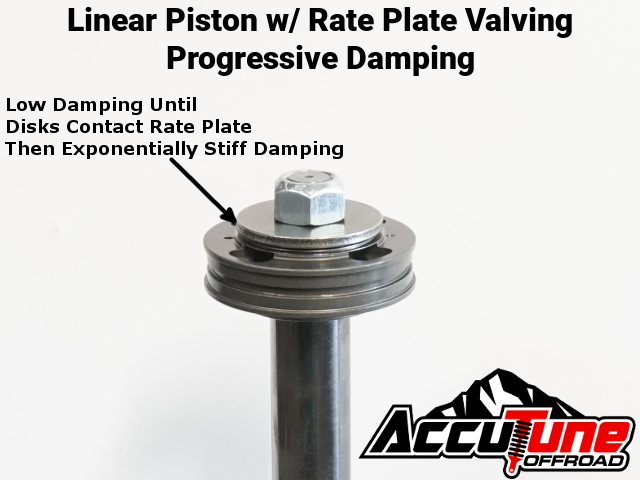 This method results in inconsistent damping on both sides of the piston and should not be used (although we see it far too often). 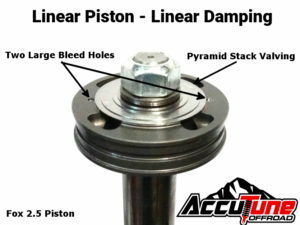 There are a lot of options for piston design and damping curve design but anything too extreme tends to deliver undesirable performance in traditional shocks used for off-road applications. Digressive pistons can be advantageous for on-road use or for those not adverse to a rough ride. 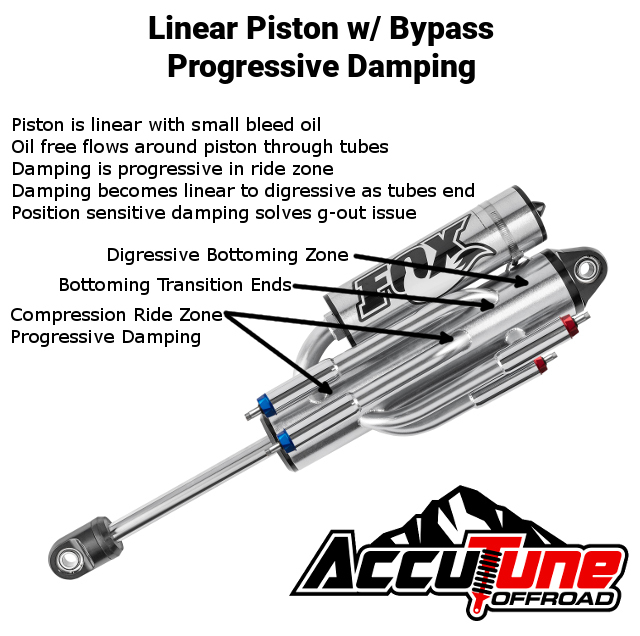 Linear pistons with progressive damping curves can provide an exceptional ride as long as the tuning and methodology is done correctly and bottoming is well controlled. Linear damping curves provide the best all around performance in standard designs. 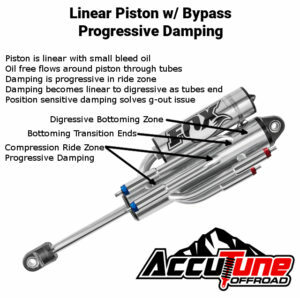 No matter what you choose AccuTune Off-Road will tune the damping curve to deliver the performance you’re looking for.